I am an ardent saver of fruit that is overly ripe and on the cusp of going bad. Saving it for other uses is really a snap--just toss it in a plastic bag in the freezer. 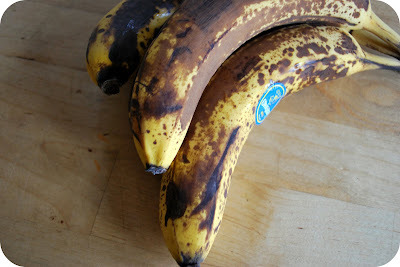 We perpetually have a big bag of over-ripe bananas in our freezer--as well as smaller bags of things like strawberries, blueberries, mangos, pineapple, etc. Always stuff that was on its way out if left to languish in the fridge much longer...no fruit is left behind at our house. Those overly sweet fruits (as they are inclined to be late in their lives) are a perfectly lovely additions to things like muffins, smoothies, pancakes, even made into glazes or sauces. 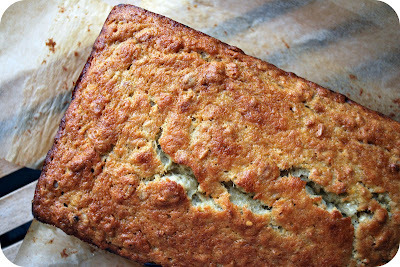 Of course, banana bread is the old stand-by for overly ripe bananas--and yes, I am going to share the recipe for my version which incorporates oatmeal and other whole grains (as do most all baked goods I make). I love this bread--I eat a couple of slices each morning, slathered with peanut butter, aside coffee and half of a grapefruit--it is my go-to winter breakfast, if you must know. And yes, you can use bananas from your freezer for this--simply defrost the amount you need and use them as you would any other over ripe bananas. You should be prepared for the fact that when you thaw bananas from the freezer they will have quite a bit of liquid floating around with them and that is okay--I simply mash this in with the rest of the banana and use as usual. Happy over-ripe fruit freezing and baking. Words cannot describe the deliciousness that is this bread. I would love to try this but cannot download the recipe. Why not put it in your post instead of having people download it?